A week ago the ancient electric pencil sharpener died. The motor could be heard spinning when a pencil was inserted, but no sharpening action. I took it apart to find the large gear that drives the sharpening mechanism was broken in two pieces. As I shook it out, it broke again. Time for a new unit? Not with a 3D Printer! 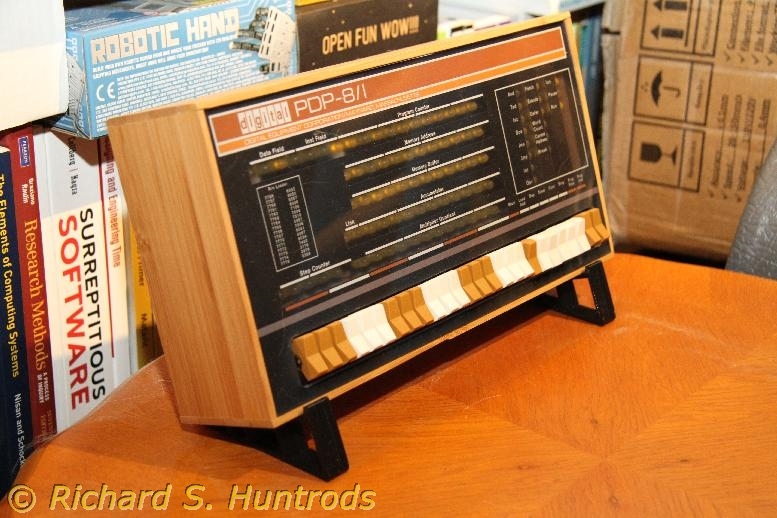 Before I gave up on this item, I would try and print a replacement gear. Designing gears is not fun, but the on-line CAD program Tinkercad had a community supplied gear builder. 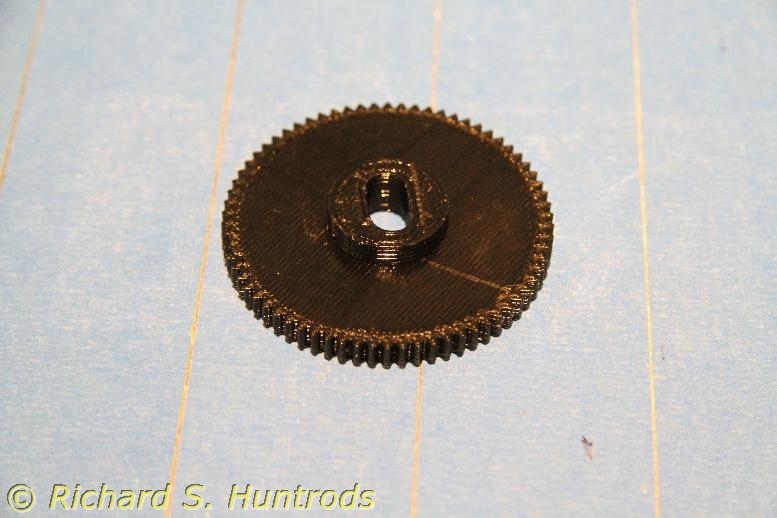 I took measurements from the broken gear, counted the teeth (70) and designed a new one. My first print wasn’t correct. 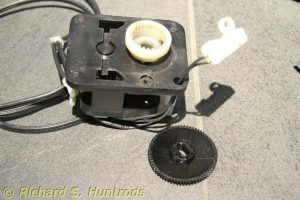 The broken gear did not reveal the drive slot was only partially into the gear, with a round shaft for the rest. Once I had one new gear with the slot all through it was easy to see what needed to be done. The next gear fit well and worked. It’s noisy, but it works. 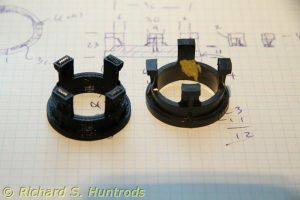 The next challenge was designing an optical connector for my underwater camera housing. The very expensive part from the manufacturer (double any equivalent price) screws onto an optical fitting on the housing. 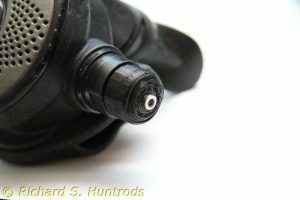 The bare cable has an optical end, but must be mechanically connected to the strobe and housing. On the strobe it’s a simple hole, but I needed something similar on the housing. Again using Tinkercad, I was able to design a simple connector. It took a few tries to get the sizes correct as things must be tight but still fit. After 5 tries I had a good fit. Now to take it to the water for a test dive. 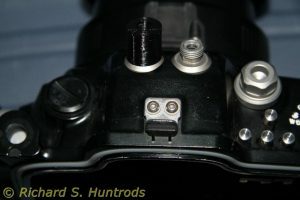 The optical port is shown mounted on the housing on the upper center left. 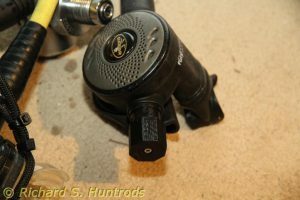 As promised in my last post, here are some photos of the weight plate collar and the new regulator flow knob. Also a photo of the old knob for comparison. 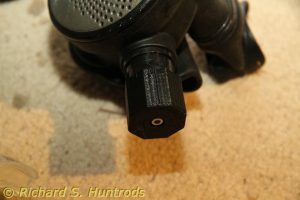 Last week I designed another gear item for my camera and underwater housing. The 60mm focus gear works perfectly, but I was curious if my 17-85mm zoom lens would work in the housing with the current port. The problem with ‘just trying it out’ is that while I can put the lens on the camera and fit it in the housing & port, I know that at 17mm there will be vignetting as it’s not a dome port. What I really wanted to test was whether or not it could zoom enough to be useful. However, just trying to install the lens zoomed might not fit. What I needed was to be able to actuate the zoom with a proper zoom gear. Which meant designing and printing a proper zoom gear. Based on my focus gear design, I created a new model based on the focus gear cylinders, but sized for the zoom lens which had quite a bit larger diameter. The zoom lens also has a noticeable bump where the autofocus switch is located. After a few test prints, I completed the final design and printed it. The first print was very good, and fit perfectly. With the zoom gear complete, I was able to install the lens on the camera (with zoom gear) and then into the housing on wide angle. Once in, I could clearly see the vignetting, and then tested the zoom gear. Again, it worked perfectly, but the lens quickly bumped the end of the port. Sadly, it was nowhere near close-up, and still showed vignetting. 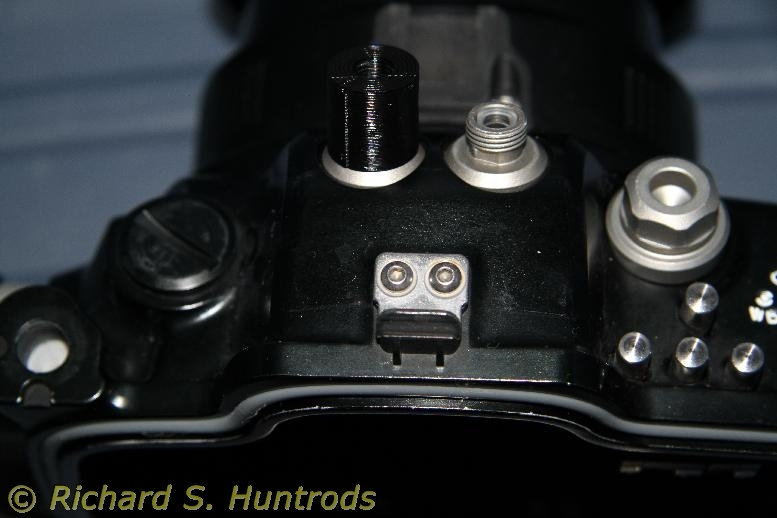 In the end I will not be able to use the zoom lens in the underwater housing with the current macro port, but if I ever win a lottery and buy a dome port, it will work perfectly. In other news, I’ve been watching a lot of youtube videos on “delta printers”. These are 3d printers that employ a triangle pillar system to control three stepper motors, which in turn move a trapeze supported on the three pillars. It’s a very fluid moving system, and most fun to watch. There is one new version that has one extruder but three filaments, and can mix colors on the fly! Watching build videos it’s clear that some of these printers are extremely well designed for kit building. The only downside at the moment is there are very few inexpensive kits that offers both heated bed AND multiple extruders. The best kit I’ve found so far (for build quality) comes with only one extruder and no heated bed. While the heated bed is pretty easy to add, conversion to multiple extruders is a very advanced topic. The other downside is many come direct from China, and that’s always a bit of a crapshoot when it comes to the thing actually arriving at my door. So far I’m around 90% but still… to lose a $300-$400 kit would not be good. Tinkercad is still by far the easiest program to create simple designs for test printing and design. Fusion 360 is slightly superior to Tinkercad but ONLY because it ‘automatically’ bevels holes. I realize that’s just a default parameter setting, but still – it means my final design has a bevel when an interior hole is reduced, which means no support structure required and thus faster/easier printing. But – Fusion 360 is still a bit of a pain to use, especially compared to Tinkercad. I usually end up deleting my first effort and trying again (and again) to get the desired final result. It’s annoying because the options/interface is so horrid. Example: I ‘accidentally’ created two bodies when I wanted just one. I don’t know how I did it, and can’t reproduce the case, but once created I could NOT find any way to merge the two bodies back into one. It should be as easy as “select both, press ‘merge'”, but there’s no ‘merge’ function that works this way. Finally, Sketchup. What a horrid beast of a program so far. Not only is it quite counter-intuitive to build anything like a cylinder, but I cannot find a way to export the result as a printer file. Not looking good for Sketchup at this point. As for printing, I did discover one odd behaviour about slic3r. If you add multiple designs, say add a gear to a cylinder, or just add two of the same thing and arrange them, the resulting gcode file contains the complete model. HOWEVER, if you save the stl (model) file, only the last thing added gets saved. YOU CANNOT SAVE A COMPOSITE MODEL in Slic3r. That’s a pain, but I can live with it now that I know. 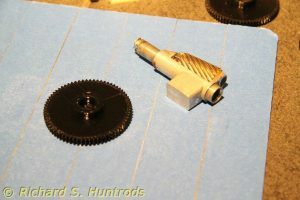 Other news: I built another gear model for the Canon camera. This one is a zoom gear for the 17-85mm zoom lens. The gear is the same one used for the 60mm focus gear I built last week, but the cylinder ID was larger to accommodate the larger diameter of the zoom lens. There were a few other adjustments as well, but the final zoom gear fits and functions perfectly. I tested the focus gear in the housing underwater last weekend, and will try the zoom gear and lens in the housing this week. If it fits and works, I’ll test it underwater this Sunday. Note: The zoom lens is not designed for this port, but the port is longer than needed for the 60mm lens, and so I thought I’d like to try it on the camera in the housing. Before I could do that, I really needed the zoom gear to be able to actually test the zoom function in the housing. It’s a ‘chicken and egg’ situation really. Also, until I had any working gear, there was no point worrying about the zoom lens. That dictated the 60mm focus gear being designed and printed first. Once that worked, the way was clear to go for the whole zoom test.